I'm 6 ' 10 " , & no , I didn't play basketball !! Marty Mercer , founder of the "Big Dog" Mercer Band, arrived on the Chicago music scene in February of 2000. He moved here from Wisconsin where he was a sideman for a touring blues band. Needing to stretch out musically, he decided to make the big move to the "home of the Blues". He started showing his face at the local jams where, after playing, was donned the moniker "Big Dog" by local blues musicians. Since arriving here he has shared the billing with such acts as:The Fabulous Thunderbirds,Billy Branch,L.V.Banks,Toronzo Cannon , Ronnie Baker Brooks , & Mud Morganfield (Muddy Waters Jr.), just to name a few. He has also donated his time to several charities & fundraising events including "Blues for kids' sake" cd for the Big Brothers & Big Sisters Foundation. 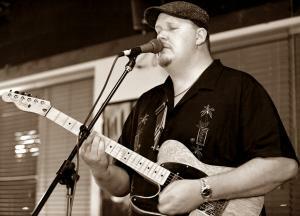 In April 2007, he was crowned Joliet's "King of the Blues" at the Joliet Guitar Center. He has many influences that he calls upon to make his own style of music that has been called many things. "Bluesbilly" & "Swamp Boogie" are a couple. His soulful vocals that sometimes growl, his aggressive slide playing, & heartfelt string bends make him unlike any other musician around.